Written by Catherine Saxelby on Wednesday, 15 November 2017. I stumbled over this loaf in my IGA supermarket at Drummoyne in Sydney's inner west. I don’t go there all that often. There it was, sitting at the start of the bread section, screaming out to me via its bright yellow and red colours on the label. Is this yet another “lower-carb bread” (there have been lots lately)? Does this taste as terrible as most lower-carb products do? Is this a bread a dietitian would be happy to recommend? Read on to find out the answers to these and more. Considering it has only a small 5.6 percent carbs, it is a very flavoursome and nice-tasting loaf with a soft pleasant bread-like texture which rather surprised me. Regular bread comes in at 40 to 50 per cent carbs so quite a reduction. Extremely good in appearance. This is surprisingly different to anything else out there and tastes like a moist soft real bread. Kept me full for hours after eating. I ate one slice with peanut butter and was surprised how full I felt for 4 to 5 hours after eating. Interesting. High in protein – it delivers an incredible 26g protein per 100g which is higher than eggs at 12 or regular bread at 9 g per 100 grams or per cent. Low in GI with only 24 which will be of interest to people with diabetes. Think slow digesting. It has a Glycaemic Load of only 1. This makes it about the lowest GI and GL bread on the market. And it has credentials - it’s been tested by the official Sydney University Glycemic Index Research Service (SUGIRS) so it’s all above board. Suitable for anyone on a ketogenic high-fat diet. More expensive than other mainstream breads – a loaf costs A$6.99 which is about double that of other regular loaves. Hard to find – it’s not in Coles or Woolworths, the two major supermarkets in Australia. Quite dark in colour (see images) so won’t suit the brown-haters and those who love a white-white loaf. Doesn’t toast well. I re-pressed the toaster four times and it barely browned at all. My milling friends said this was normal for something based on wheat protein (gluten). Lupin is a legume that has just come on to the list of allergens for a minority of people. It’s been grown for yonks by farmers to feed their cattle or sheep when they needed building up. Water, wheat protein, soy protein, lupin protein, soy meal, linseed, sunflower seeds, soy grits, wholegrain wheat meal, wheat bran, soy flour, yeast, vinegar, apple fibre, iodised salt, roasted malted barley flour, emulsifier (322), acidity regulator (262). Why does it need apple fibre? Why does it need wheat bran when there is already whole grain wheat meal? Not forgetting the seeds and soy grits? So far, I’m none the wiser. For a specialist loaf like this, that’s a shame. I only ask to anticipate the queries I may receive from you the readers and so like to be well informed. As I love bread and have worked at the Bread Research Institute for five years, I understand bread formulations and how ingredients work to create a pleasant well-risen loaf. Unfortunately for now, you’ll just have to accept the ingredients in this bread as is. In terms of taste and mouthfeel, this is the best out there. Just close your eyes when you sink your teeth into it so you don’t notice its dark colour. If you love bread, as I do, but have to shed weight or have diabetes, this bread is a good addition to your kitchen. I remain pleasantly surprised. 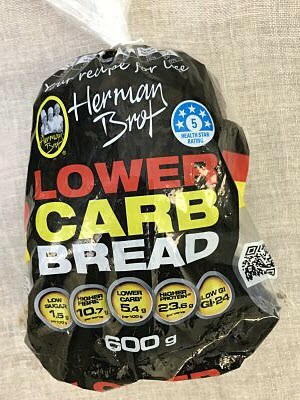 This bread looks identical to the Hermanbrot above, being the same 600g in weight, dark in colour, identical nutrition figures and identical list of ingredients. But the good news is that it costs only A$4.99 at an Aldi supermarket so is around $3 cheaper! This may interest you if you live near an Aldi and can buy it there. March 2017 Foodwatch Newsletter - Carbs, low-carb, no-carb – what’s best?